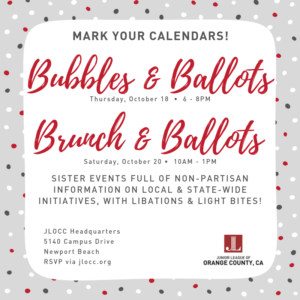 Come join JLOCC and The League of Women Voters for an evening of non-partisan information on local and state-wide initiatives as we get closer to the November 6 General Election! We’ll bring the libations and bites, you bring your sample ballot, laptop, ballot guide, or at least your thinking cap as we review some ballot measures and races of particular interest to Orange County. Voting can be a daunting task with so many offices and bills to consider –we’ll make it a little easier for you in a digestible way, and who doesn’t love mimosas and doughnuts? !